If you are a vegetarian, this is probably a good point to turn back. I like to eat meat and I believe it is natural for humans to eat meat. I believe that if you eat meat, you should be prepared to face the fact that it came from a live animal. But I do get a bit squeamish when I have to deal with a dead furry animal that still has its skin. And I’m glad that this hare was already killed when we got it, as I’m not sure how prepared I would be to kill it myself — even though I thrust a knife through a lobster’s brain once in a while. As soon as the skin is off, I’m okay with doing the rest of the butchering. We got this hare since Kees’ boss likes to hunt, and he had shot too many hares to eat by himself. So Kees brought one home and we left it to age for a few days since this develops the flavor and tenderizes the meat. Don’t age it too long, as the gamey flavor may become too strong. There are recipes that use the blood of the hare, but since it wasn’t completely fresh when we got our hare we decided against that. Kees is more brave than I am, so he skinned the hare. This was the second time he did this, so it was slightly easier than before. I would still recommend to have a butcher do this for you. 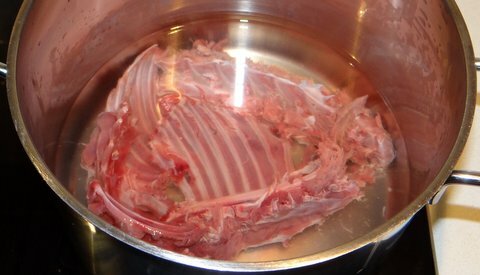 I did the butchering, and separated the hare into three parts: the loins and tenderloins, the legs, and finally the bones. 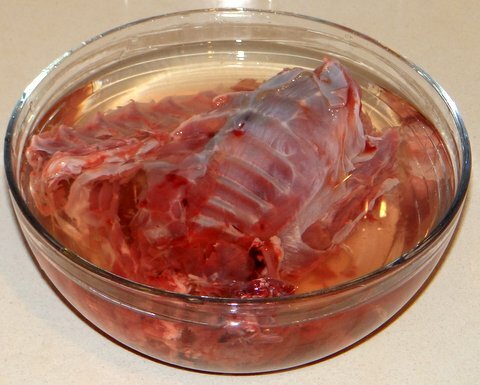 I soaked the bones in cold water to remove the blood. 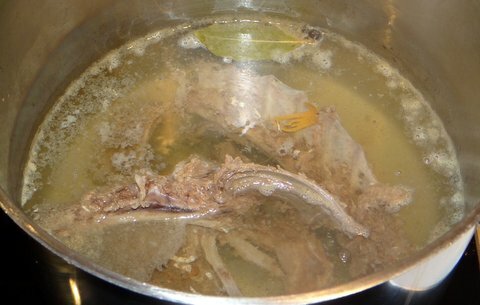 I then put the bones in a stockpot and covered with cold water. I brought it to a boil and removed the scum that rose to the surface with a slotted spoon. I then added a bay leaf, some black pepper corns, some juniper berries, a piece of mace, and some cloves, and let it simmer for 2 hours. I then chopped some leeks, carrrot, celery, onion, tomatoes, and dried porcini mushrooms. 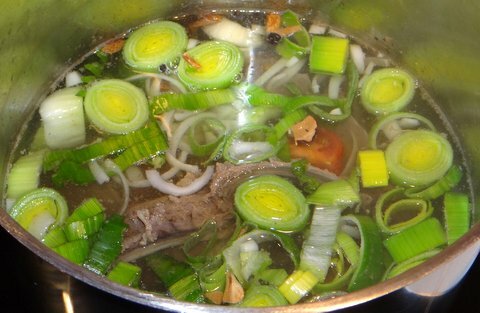 I added the vegetables to the stock and let it simmer for another hour. Then I sieved the stock with a fine sieve. 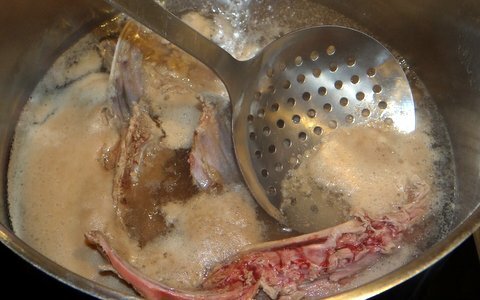 I didn’t pay much attention to keeping the stock clear, as I was going to use it to make sauces anyway. Parts 2 and 3 will follow with the preparation of hare loin with sauerkraut, mashed potatoes, chestnuts, and a red wine sauce, and hare legs in red wine with celeriac and mashed potatoes. You have outdone me with your shot of the hare with it’s “jacket half off” as they say. Excellent post. Bring on 2 and 3. Thanks, Conor. I have many shots that are too bloody or otherwise gruesome for a food blog, but I liked this one. For me it’s the innards too that are the problem. It’s a good thing I have a strong stomach, because I can assure you that after a few days of aging removing those was quite smelly. It’s also why I always ask my fish monger to gut the fish, while I do the filleting myself. Thanks. I’m glad I had my husband to help out with the skinning part! My Joy of Cooking had detailed diagrams for skinning squirrels and other small animals. Thankfully I never had to consult them. So glad we live in the times we do. Boy, Stefan, does this post take me back. My Dad was a hunter and he taught me how to dress a hare, as well as fowl, when I was a boy. I’ve not done it in decades, though, and I’m in no rush to become re-acquainted with the practice! On the other hand, I almost bought a rabbit today for braising but decided to postpone that dinner for now.